The Kaitlyn upholstered bed is the perfect centerpiece for your bedroom. 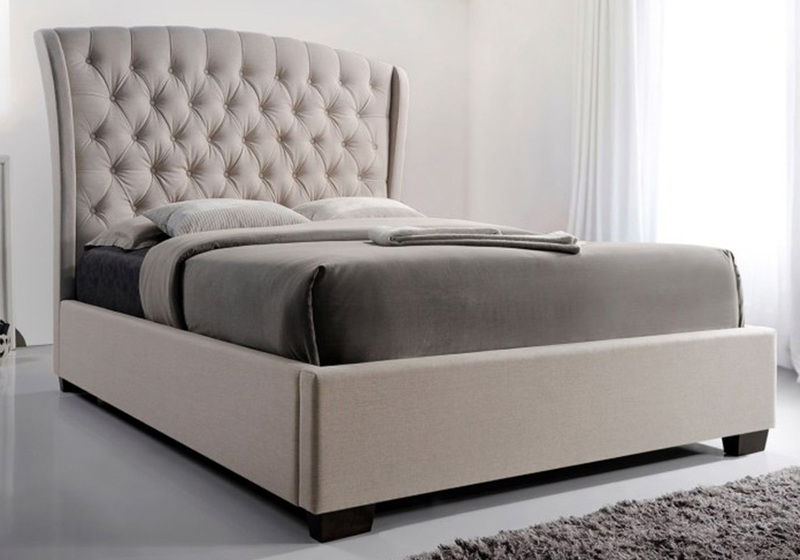 This oversized bed features an elegant curving headboard with diamond button tufting. The edges of the headboard are slightly winged, adding to the graceful design of the bed. This bed is available in wine and grey fabric. *The price does not include mattress, boxsprings or bed linens. Started in 1983, Crown Mark has strived to offer great quality, competitive pricing, unbeatable service and unparalleled styling on imported wood furniture. Their furniture designs promote comfort and elegance, and they take pride in always being in tune with the latest styles of the furniture industry. Crown Mark delivers incredible value by arranging their own manufacturing directly, dealing in larger volumes, by maintaining effective management and a high level of employee experience. Based in Houston, Crown Mark ships product incredibly quickly from its Texas & North Carolina distribution facilities.